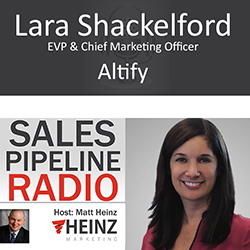 Our guest is Lara Shackelford of Altify. Altify sells to sales professionals. With their software, every sales rep can sell like your BEST sales rep. More reveals followed at DreamForce as it ties to AI and Einstein. Matt asked what AI means to sales and marketing leaders. Lara told us, "It's important to bring the augmented intelligence piece to help humans perform better. An example - a sales rep is working 4-5 deals critical for the quarter, with our software they can be notified if a change is noticed affecting their influence on the sales decisions by looking at more than past data." Predictive - predicts what will happen in the future based on a lot of data. This involves high quantity of data. Augmented takes knowledge and context into providing a solution and be able to flag insights to alert the human to be more effective and generate results based on the data and knowledge. This has been the missing piece - the CONTEXT. This helps guide the next best step. Catch the replay of this show to get more insights from Lara Shackelford. Lara is a leader in marketing strategy, innovation and execution, building market prominence for some of the largest technology enterprise companies as well as the most innovative Silicon Valley startups. She is known for creating a culture of success that enables brands to clarify, amplify and elevate their share of voice in a crowded marketplace. As EVP and CMO of Altify (Formerly The TAS Group), Lara is responsible for driving market leadership, global awareness, alliances and channels, demand generation, product marketing, content marketing strategy, and strategic events.